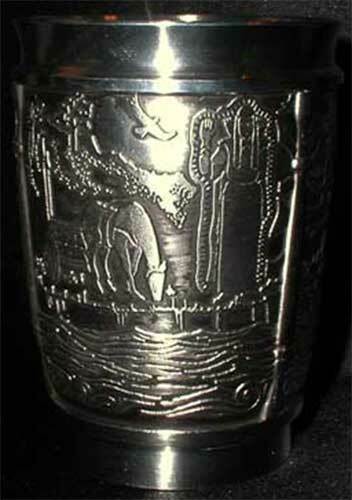 This Irish whiskey glass from Mullingar Pewter features a card with the Children of Lir legend. Lir came to live near the lake so as to be close to his children. A law was made that no one in Eire must ever kill a swan and that law has been observed to this very day. The time passed conversing with the children and listening to their song. 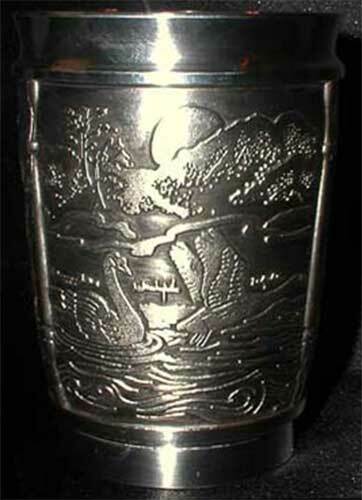 This pewter whiskey glass features the Irish legend of the Children of Lir depicted on three embossed panels. The Irish whiskey glass is a lowball or double old fashioned size that measures 3" wide at the rim and stands 4" tall; the 10 ounce glass is made of lead free pewter. 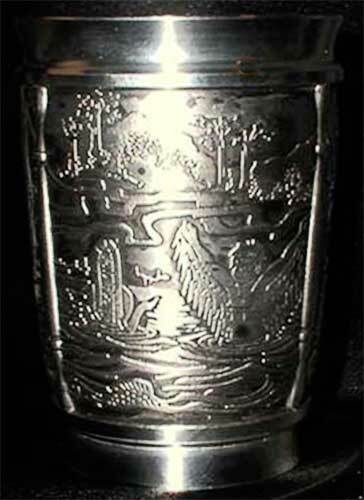 The Irish legend whiskey glass is made in Ireland by Mullingar Pewter and it is gift boxed with the Children of Lir legend, complements of The Irish Gift House.